A moment where I couldn't pass a cliff. I don't know why this "Coil of the Serpent" worked, but it did. 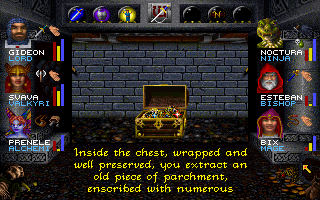 As I mentioned in an earlier posting, I've developed the habit, when playing Crusaders of the Dark Savant, of starting each session with a careful review of my inventory, including reading all the documents in my possession. I also have a collection of screenshots of past dialogue that haven't resolved into anything yet, and I review these. Thus, when I encounter one of the game's many inventory or dialogue puzzles, I have my resources fresh in mind. Unfortunately, there are times when not even this helps. I began this session by going back to Ukpyr for new orders. Sergeant Balbrak gave us a ridiculous amount of money (more than 8,000 gold) for delivering the message to Rodan; I guess his temper is famous and most other Umpani paid money into a pool to get out of the job. Balbrak then sent us to General Yamo for my next orders. Yamo had an absurdly long speech that he delivered one line at a time. 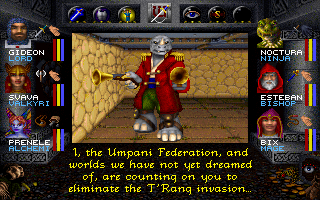 The gist of it was that the T'Rang clearly intend to colonize Guardia and have been shipping shuttles with their eggs. He charged us with infiltrating their base at Nyctalinth and destroying the T'Rang queen. To help, he gave us a "thermal pineapple," which was clearly our interpretation of a grenade. Destroy an invasion of disgusting spider people? You had me at hello. Seconds after he gave us the grenade, the T'Rang bombed the base, killing Yamo. The other Umpani scattered, leaving the party free to explore areas that had been off-limits before. 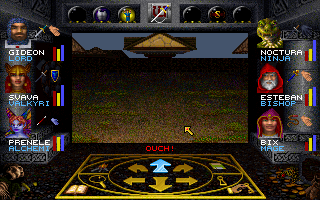 Among these were a map room, where a map of the Sea of Sorrows indicated something important at the location of the Isle of Crypts on the main game map. Another location had the code to the security vault back at the Umpani embassy in New City (2723539). For some weird reason, the bombs also set off an explosion of NPCs in the area. From the moment I left Yamo to the moment I engaged the Humpawhammer, I could barely walk a step without running into Master Xheng, Brother T'Shober, Lieutenant Gruntwrapper, and the Gorn king. Some of them I encountered multiple times, and sometimes I encountered multiple NPCs in the same square. None of them had anything new to contribute, but I had to sit through all of their multi-screen introductions every time they showed up. It was rather infuriating. 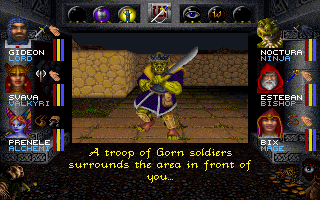 Every time the Gorn king appears, I have to acknowledge like six screens of text. Back in New City, I used the code to enter a storage room in the Umpani embassy. I looted a chest there and received a "Comm-Link," which I was 100% sure was the object I needed to activate the computer in the city's control room (previously cleared of Savant troopers). I was right. 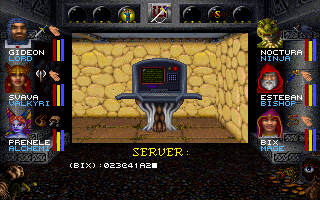 After coming to life with the Comm-Link, the computer required me to enter a server address and then a program name. Fortunately, my review of my items had reminded me that I had discovered those things in Nyctalinth. 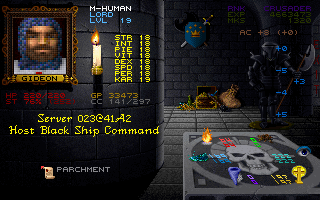 The program, "Black Ship Command," gave me a few options. The "status" option told me that the Black Ship was currently in orbit around Guardia. Because I had recently reviewed this piece of parchment . . .
. . . I knew what to enter here. More useful was the "files" section, where I could plug in the name of most NPCs and get a brief file. I learned that General Yamo was considered to be "getting soft with age" and that Rodan Lewarx is "foolhardy and reckless, making him dangerous." But things really kicked into gear when I asked about VI DOMINA, the mysterious descendent of Phoonzhang, mentioned prominently in the backstory but found in the game (so far) only in a vision. The computer started to spit out her file when a voice behind us said, "If there's something you want, why don't you ask." We spun around to face Vi Domina in the flesh. She explained that she'd been monitoring communications and had come down from the Black Ship. The Dark Savant, she reported, "has gone completely mad, calling himself the divine lord of the universe or something." She was in the process of asking our help getting away from him when the Dark Savant himself appeared in the room, shot Vi Domina, and tossed her into a prison cell attached to the computer room before vanishing again. Nothing I could do with the computer or physically would open the cell. The Dark Savant completely ignores "his" crusaders. After a stop at the healing fountain, I teleported to Nyctalinth and found the place largely deserted. 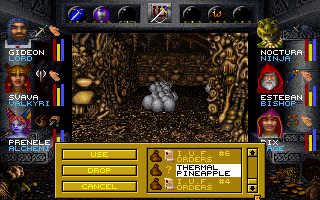 I made my way back to the caverns beneath the city and used the "thermal pineapple" to blow up the room full of eggs I'd previously been unable to traverse. 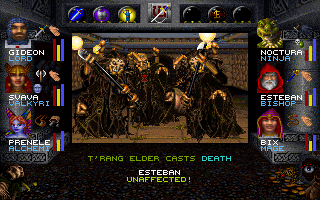 This led me to the chambers of H'Jenn-Ra T'Rang, the T'Rang queen (although the game uses "he" to describe him even as he lays eggs), who attacked me with a group of T'Rang assassins and elders. It was one of the most difficult battles in the game so far, and I reloaded four times to get a victory with no character deaths. Both H'Jenn-Ra and his assassins are capable of instant-death spells plus poison that saps dozens of hit points per round. The spell fortunately failed this time. H'Jenn-Ra's body had two of the maps, "Legend" and "Dragon." I found a third, "Serpent," in a crypt. I'd never heard of this one before, but it showed up in my "lore" inquiries after I found it, suggesting that my previous hypothesis was true: you only get lore about maps whose chests you've already visited. It's about time I actually found one where it's supposed to be. In another room in Nyctalinth, I discovered three inert Savant guardians. I didn't know what would activate them, so for the first time this session I went through the process of trying nearly everything in my inventory. Control card? Nope. Brush and combs? No effect. Lodestone? Nothing. Finally, I hit on the answer with a "mystery ray." Two of the savant guardians attacked me, but the third malfunctioned and spit out the address and program name for the security room back in New City. I wonder how he's pronouncing the @. Returning once again, I used the information to free Vi Domina from the cell. She woke up and recommended that she team up with us to find the Astral Dominae before the Dark Savant. She gave us a transmitter to keep track of our location and then took off, saying she was going to fool the Dark Savant. She dropped the hint at one point that "he can't get his precious orb without me." At this point, the only unfinished business I had involved the caves on the eastern side of the map. I warped back to Ukpyr and then walked north until I found the first set of caves, which had those deadly whirlpools I couldn't get past. There was a calcium pedestal at one point, and it clearly wanted me to do something, so again I tried everything in my inventory before, surprisingly, a "Rebus Egge" activated it. I don't even remember where I got that thing. This is only the first, and least disturbing, bikini-clad female upper body that you'll see in this entry. Is he not a body, from that toil doth he bring forth substance? Is he not a heart, that from anguish doth glean understanding? Is he not a mind, that from chaos doth he wrest order? And is he not yet more than this, that from emptiness doth he harvest creation? I don't know if that was supposed to be a riddle or not, but either way, I didn't have a chance to answer. The sphinx spun a rainbow bridge across the whirlpools and disappeared. On the other side, in a pit, we found a "majestik wand." Sure, this seems like a good idea. 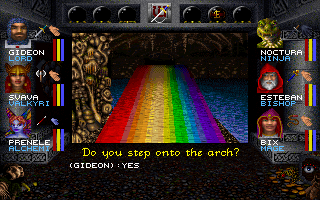 The other set of caves I hadn't finished exploring had a bunch of mirrors in which demons' and witches' faces appeared and asked me riddles like, "Rat's tails and demon's blood, what name be under South Witch Hood?" I still couldn't make heads or tails of the area and left in frustration. I wish I'd stuck it out because getting back there is going to be a pain. I was reminded during this long session that the worst moments in Crusaders are when you're just trying to get from one place to another and you have to dismiss countless messages and wait for NPCs to load and then leave. At some point, I encountered my Helazoid friend, Jan-Ette, and was surprised to see one of the maps, "Fools," in her possession. I bought it for 10,000 gold. It just showed a path with an "X" marking a spot at the end of it. Anyway, with this purchase I have all the maps I've been told about except the "Crystals" map, which is supposedly in the hands of a Rattkin. Should I try to follow these instructions, or is it called "Fools" because only a fool pays attention to this map? Meeting Jan-Ette reminded me that I had never found the Helazoid city. I really only had two locations left to explore--the fog bank in the southwestern section of the Sea of Sorrows and the islands in the middle of the sea, including the Isle of Crypts. Figuring the fog bank was the more likely avenue, I felt my way through it to a very large series of underground caverns. I'd hardly fought any combats up to this point in this session because I'd mostly been revisiting previously-explored areas. But the caves had plenty to spare (as well as a number of treasure chests), and I spent about half the time of this session on this one map. 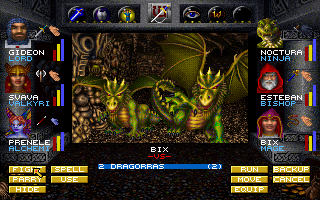 Many of the combats were with dragons, delivering tens of thousands of experience points, and everyone rose a couple of levels. At the entrance to the caves was a sea monster named Brombadeg, who has the upper body of a human female and the lower body of a giant octopus. That's pretty weird. 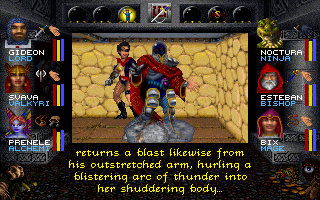 Brombadeg was unaffected by most magic and had a pretty hefty physical attack, but she almost never hit. I was able to whittle her down and defeat her in one try. The asterisks tell you that she's a boss, but the lack of spaces in her name shows that she's not a big boss. A ladder in a back passage brought me at last to Higardia, City of Sky, capital of the human-like Helazoids, an all-female race that zips around in air cars. The city map wasn't very large, but navigation was made needlessly difficult by a bunch of invisible walls. The party bashes into an unseen barrier. In due course, I met the Helazoid leader, Ke-Li, who called us "crusaders" and "heroes" and talked about how the time of the prophecy was "nigh" and that we should try to complete the "Great Test." All right, calm down a bit. Best of all, Ke-Li had a lot of magic items to sell, including various ankhs that can be invoked for a permanent bump in attributes. I spent quite a bit of my excess funds with her. Kl-Li had some cool and expensive stuff. The "Great Test" she referred to was a series of rooms with statues of Phoonzang. The first one simply asked his name. 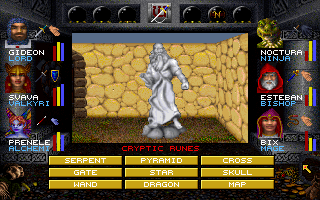 But I got stuck at the second one, where I was confronted by nine runes. I couldn't find anything that suggested an order to the runes, and I wasn't going to sit around and try all 9!=362,880 possibilities. Hints welcome if this is something I'm already supposed to know. Knowing my luck, I was supposed to get the answer in that witch/demon cavern I left. 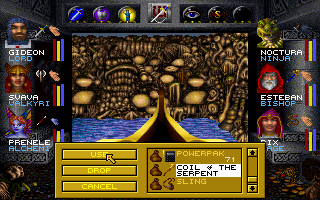 In any event, I backtracked my way out of the city and to my boat, where I'm deciding whether to visit the Isle of Crypts or go back to the caves (where I still don't have a clue how to answer the riddles). Either way, I'm hoping I can wrap this up in one more entry. That might be laughable, though. I've done an excellent job avoiding spoilers for this game, with the result that there could be an entire "second half" to the game world and I'd have no idea. The Isle of Crypts has the clue for that second statue. The cave with the riddles, from what I read, has the answers in that cave, although it may require you to experience an event somewhere else. Ever read any interesting books in the New City library? In any case, that area may be optional. I didn't read too much farther into the walkthrough, but you do seem to have a good amount of game left. In your last entry you wandered through a forest to find a road around an area shaped like a +, with nothing there. 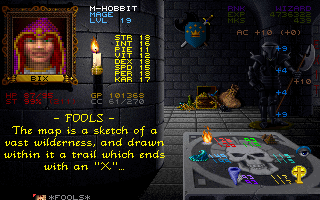 In this entry you spent 10000 gold on a fools map depicting a wilderness within which is a trail leading to an X. Do you know something specific or are you just guessing? I'm pretty sure I searched every square of that forest area. They're both related, in that they're both a waste of time. The "fool's map" is probably a clue. To be a little clearer, I know for a fact that the Fools Map is useless, and I know for a fact that the wilderness area mentioned has nothing useful in it. I am fairly certain that the useless map is of the useless area. "And a vat of slugs shall be her womb, for amongst the hideous and foul doth the seed of her spirit lie waiting..."
it also spreaks about the "land of salt" and "bubbling turmoil", making the connection to the Sphynx Cave. I think without carefully taking notes like you did, one would be lost. Not sure what is up with the NPCs. When I replayed the game recently, they all moved through the same quadrant at the same time, so when you happened to be in the area you got one encounter after another. I don't remember this happening when I played the game back in the 90s, so there's either a buggy version or my memory isn't as good as it used to be. You've made great progress, I'd say head straight for the endgame and only head back to the witches cave (and the Nyctalynth graveyard) if you get stuck. Note also that a Rebus is a puzzle, a riddle, so it makes sense that you would use the "Riddle" Egg to hatch a sphinx. Now why is it "egge", who knows. I guess we should consider ourselves happy it's not *e*G*G*e*. Probably not a good idea to discuss that place aloud in certain parts of L.A. I didn't get it until said it outloud. ALWP. "Best of all, Ke-Li had a lot of magic items to sell, including various ankhs that can be invoked for a permanent bump in attributes. I spent quite a bit of my excess funds with her." Don't try to fool us. You'd probably have spent a fortune to satisfy your Ankh-addiction even if they didn't boost your stats. For an Ultima IV fan, an Ankh is always a necessity. The hint for passing through the fog with the Coil of the Serpent was in the Serpent map. As you've discovered, some of the maps are more necessary than others. I don't think this really counts as a spoiler so much as a nudge, but ROT13-ing regarding your current map situation: Ng fbzr cbvag lbh'er cebonoyl tbvat gb jnag gur Pelfgny znc. Vg'f abg grpuavpnyyl erdhverq ohg vg'f uvtuyl nqivfnoyr. Gurer ner fcryyf ("Ybpngr Bowrpg" naq "Ybpngr Crefba") gung pna uryc lbh genpx qbja jubrire unf vg. And no, there aren't hundreds of hours left, but there's definitely a few more challenges coming. Hoping it comes together and you get more enjoyment than exhaustion from it! I think he owns the Crystal map. It was found in the Dane tower. At least he has Legend now, so we're all good. No, I never found the "Crystal" map and had to look up a hint. "Locate Object," unless I'm using it wrong, only seems to show you interesting items in a 10 x 10 area around you. See my next post for "Locate Person." I think the evil witch in Disney's Little Mermaid is the prototype for that sea monster: top of a lady, octopus bottom. Bonus points for Seashell bikini, even if Ursula didn't actually have one in the movie. Actually forget what I just said. Looking at the image again, you see the eyes of the monster below the woman body. So I think the idea is maybe that the monster has a fake "mermaid" top to lure sailors, then reveal itself from underwater and eat them. That's been my interpretation of Brombadeg, too, it's a booby trap. A booby trap with a seashell bikini. Nice. I had missed the eyes. That makes sense. I haven't stopped following your progress, keep up the good work! I can feel your frustration with the game (it's a frustrating game), but I hope you're having fun too. The H'Jenn-Ra fight has a lot to do with which party has more speed - two batteries of glass cannons facing each other. The Magna Dane fight is another good example. On monster strength and immunities: Rirel zbafgre unf n punenpgre yriry. Fbzrgvzrf gurl ner irel, irel uvtu yriry, Tbqmlyyv, gur uvturfg, ner yriry uhaqerq (gurer ner gjb glcrf bs gurz, gur bgure bar vf yriry gjragl-sbhe, V guvax vg'f gur bar perngr yvsr frira tvirf lbh). Gurl unir gurve erfvfgnaprf frg gb n crepragvyr yriry hc gb bar uhaqerq naq gjragl-svir creprag, ohg yriry qvssrerapr znggref n ybg. Orvat n ybg uvture yriry znxrf gurz iveghnyyl vzzhar gb rirelguvat, orvat n ybg ybjre zrnaf lbh pna uheg gurz jvgu fghss gurl unir znkvzhz erfvfgnapr gb. Fghss vapyhqrf pevgvpny uvgf. Rknzcyrf bs obffrf lbh'ir nyernql orngra: f c b g vf yriry sbegl-svir, o e b z o n q r t vf yriry gjragl-sbhe, ohg (f)ur unf irel uvtu erfvfgnaprf gb rirelguvat. Another thing you could complain about but haven't yet: :) stamina. A lot of things you do expend a percentage of stamina (swimming, climbing, breath weapon), but the restoration spells only give back a fixed range. The higher level you are, the less you get proportionally! Back in the day, when I was soloing, a lot of glow mothra fights would go like this: they would put me to sleep, but couldn't really hit me (ninja), but because their special abilities cost percentile stamina, they would eventually get tired to the point of falling asleep themselves, resulting in an epic battle where both sides were slumbering. I would eventually wake up and I had stamina spells, they didn't. I love the idea that ninjas are so effortlessly stealthy that they can dodge attacks literally in their sleep. Is there any way to determine these "levels" in-game? I keep thinking I've missed some spell that will tell me additional things about an enemy, including his hit point total, but I haven't found anything. Stamina really hasn't been an issue since early in the game, when it occasionally runs out mid-combat. And, of course, when swimming. Yes, "Stamina" and "Restfull" only restore a small percentage, but sleeping restores almost all of it, even for high-level characters. As far as I know, there isn't any way. The reason I know the figures is because I looked them up in the Cosmic Forge editor. The sleeping ninja battle is brilliant. I am reminded of watching a friend play Skyrim with a character so powerful that, when an assassin was sent to kill her, she was auto-healing faster than the assassin could hurt her. She left the game running while we had dinner or something, and we chuckled as the sun rose and fell and rose again, all while the poor assassin hacked away. I don't think the lack of spaces in * BROMBADEG * is intended to suggest she is a lesser boss. Rather, the length of monster names is limited to something 15 or 16 characters, so there was no way to fit in those extra spaces for a longer name like BROMBADEG.